Get a jump-start on your week with pre-conference workshops, providing indispensable tools and takeaways before the conference officially kicks off. Leverage this time for shared learning and networking with your peers in an intimate setting. What Are The Learning Solutions 2019 Pre-Conference Certificate Workshops? The optional Learning Solutions 2019 pre-conference certificate workshops offer a deep dive into new skills and knowledge that you can immediately put to work in your organization. All participants will receive a certificate documenting their participation in the workshops from The eLearning Guild. This year we are offering one-day certificate programs on Sunday and Monday, March 24 and March 25, from 8:30a to 4:30p. Separate fee-based registration is required. At Learning Solutions 2019, over the course of two days, there will be 9 different pre-conference workshops to choose from with wide-ranging topics! There will also be a number of BYOD (Bring Your Own Device) workshops, which are sessions that welcome you to bring your own device to follow along with the instructor step by step, ensuring you receive in-depth, hands-on training. Register for your Learning Solutions 2019 pre-conference certificate workshops now. Do More Learning Solutions and Save! 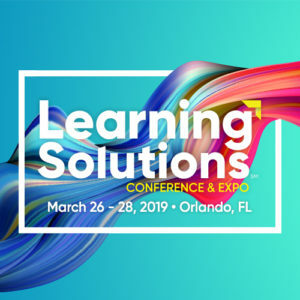 Extend your learning for a full week and save $100 on any of these certificate programs when you also register for Learning Solutions 2019—in addition to all other discounts for which you may qualify!